Hello, it’s Andy Gesner and the staff from HIP Video Promo, here to share the latest clips from one of the most influential and accomplished artists in contemporary music. Quick, name three electronic musicians. Thought of Moby, didn’t you? No surprise there: in America, Richard Melville “Moby” Hall’s name is synonymous with high-quality electronica and experimental synthpop. The groundbreaking Play sold millions of copies worldwide and, a decade after its release, still stands as a genre-defining work; 18, its follow-up, confounded expectations and set new standards for synthesizer soul. But Moby has also made punk rock records, folk rock records, house and club records, protest songs, pure experimental albums, and cut tracks that can only be described as sacred music. His songs (as we’re sure you know) have been licensed to accompany almost every kind of filmed entertainment imaginable. Few artists are as multifaceted; fewer still proceed with comparable humility, wonder, and perpetual openness to new ideas. 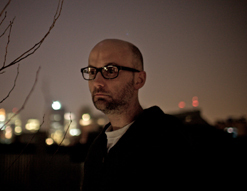 Moby’s albums are always challenging and invigorating to encounter, and Wait For Me, his newest set (out June 30th), seems likely to be another fascinating excursion. In interviews, the artist has promised us an introspective and personal set of songs, and he’s delivered – but there’s nothing muted or obscure about Moby’s latest singles. Along with producer Ken Thomas – best known for his work with the like-minded Sigur Ros – Moby has crafted a sound that’s simultaneously immediate and cutting-edge, electronic and organic, vintage and modern. As always, he’s had help from talented friends: longtime collaborator Amelia Zirin Brown sings “Pale Horses”, the lead American single, with the sufficient empathy to coax the soul out of the coldest machine. That same kind of empathy is present in Elanna Allen’s beautifully-animated video for “Pale Horses”. Themes of creation, loneliness, exploration, and the impermanence of art are explored in the clip; thanks to the steady hands and playful spirits of animators Geoffrey Johnson, Scott Martin, and Mark Salisbury, it’s a joy to watch, too. The protagonist is a small fellow of indeterminate age, alive and walking under a starry sky on a planet not unlike our own. His expressions are friendly, his intentions are good, and his handsome pair of antennae is wired to the cosmos. In his innocence and gentleness (not to mention his restless creativity), he’s a good proxy for Moby himself. He’s adorable – sweet in nature and deed – but he’s also alone on his world. He dips his finger in a puddle and draws a version of himself in the air: not a replica, because its lines are a bit thinner and fainter, but good enough for a dance. Later, he draws a pet, and a train, and rides by (imaginary?) rails to the distant moon. But the character’s creations aren’t eternal – and a flash rainshower melts away his friends and his creations. Dejected, he hangs on the lip of the moon, looking out toward a skein of stars that expands as he grows smaller and smaller. But just as we think that Allen is making a point about his insignificance, the animators “zoom” back in – and we’re taken inside his head, where all creation, all hopes, and all disappointments, reside. As a bonus, we’re appending to this reel another clip: the David Lynch-created video for “Shot In The Back Of The Head”. It was Lynch himself who Moby inspires as a primary influence on Wait For Me – the legendary director stressed the importance of following creative impulses regardless of commercial implications. We can say that both respected artists have done just that, and with their usual astounding success. It is a genuine pleasure for us to once again be working with the good people at Mute, and to have the opportunity to champion a legendary artist like Moby. If you need more info, call Andy Gesner at 732-613-1779 or e-mail us atHIPVideo@aol.com. You can also visit www.Mute.com or www.Moby.com to find out more about Moby.